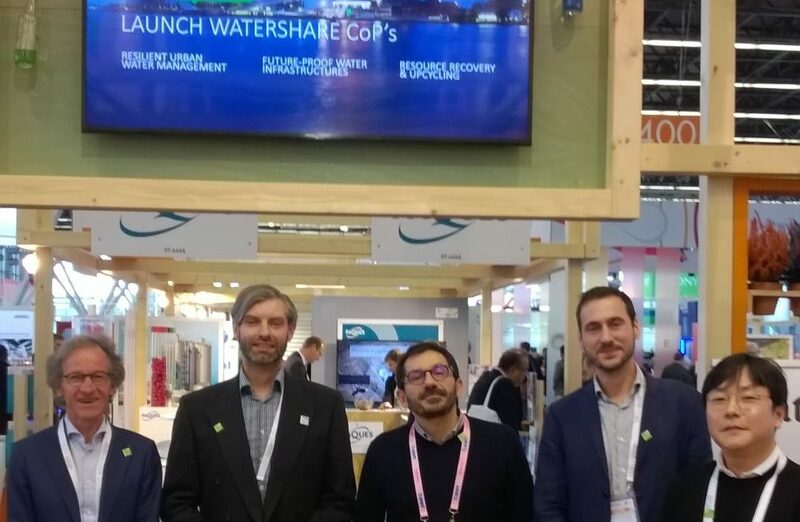 On 1 November 2017, three Watershare Communities of Practice (CoPs) were launched in the Netherlands Pavilion at Aquatech Amsterdam: the CoPs for Future-Proof Water Infrastructures, Resilient Urban Water Management and Resource Recovery & Upcycling. Watershare now has five official communities, in which knowledge institutes and end-users from all over the world collaborate in solving today’s key water challenges. The five Watershare communities gathered earlier in the week – in parallel with the Amsterdam International Water Week – to exchange knowledge and discuss joint projects and opportunities. One of the AIWW sessions related to Watershare was the one on ‘Adaptive (ground) water allocation for a robust water supply’, about a coherent approach to issues concerning seasonal water shortages, increased salinisation and land subsidence. KWR researcher Klaasjan Raat gave a presentation on COASTAR, ‘ subsurface Delta works to ensure the freshwater provision’. Other Watershare members, Staffan Filipsson, of IVL Swedish Environmental Research Institute, and Seunghak Lee, of the Korea Institute of Science and Technology (KIST), also made presentations in this session on the freshwater supply on the Swedish island of Gotland and in Korea, respectively. In the ‘Resource Recovery and Circular Water Cycle’ session, Kees Roest explained the work of the Resource Recovery & Upcycling CoP. In ‘Handling micropollutants’, Jan Peter van der Hoek, representing the Emerging Substances CoP, talked about the Watershare AbatES tool, a database in which the behaviour of chemical contaminants in the urban watercycle are described. In the same session, Barbara Kasprzyk-Hordern, of the University of Bath, gave a presentation on the ‘fingerprinting’ of urban wastewater. While in the ‘New ICT & data: solutions in water management’ session, Ralph Beuken talked about the new Watershare PIPE-works tool.